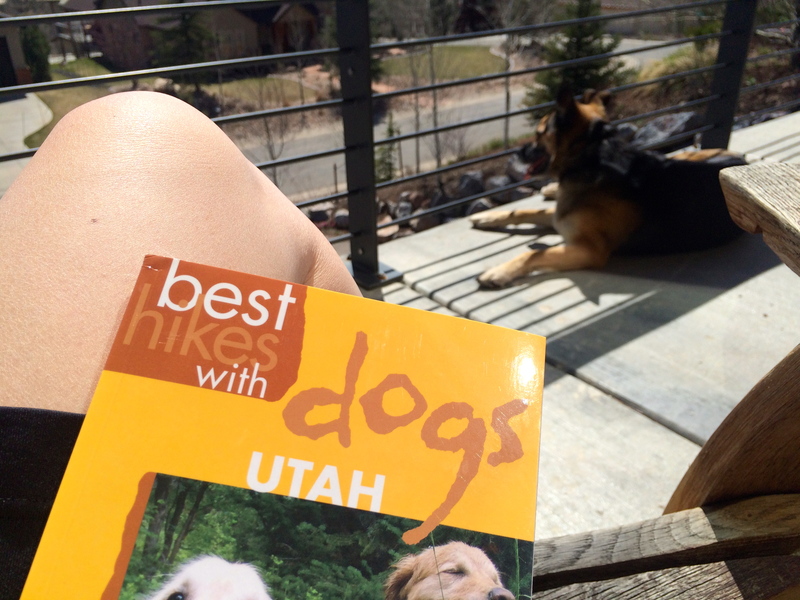 Last summer, I picked up a guide book full of Utah hikes that are dog-friendly. 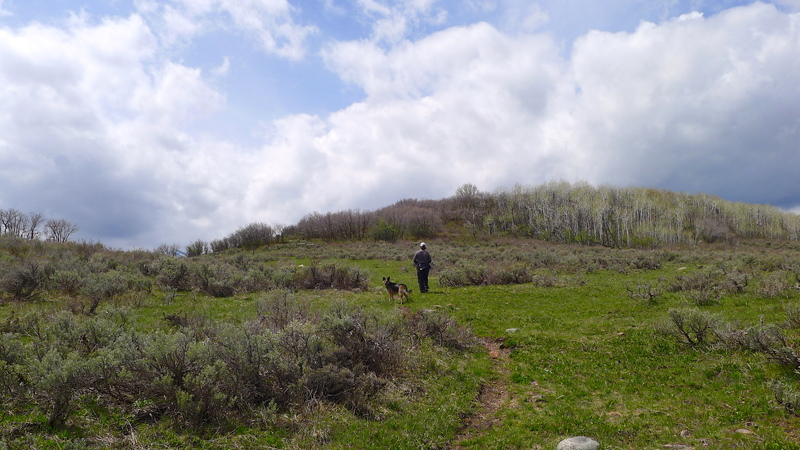 The book is well-written, with plenty of detail of the terrain and features of each hike. 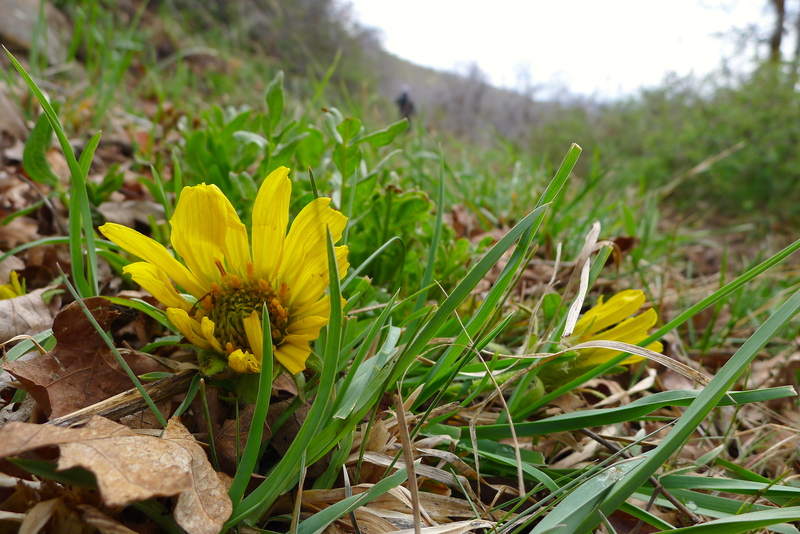 It’s been fun to read about some of my favorite local trails and discover some that I didn’t know about, like the Lewis Park Nature Preserve. 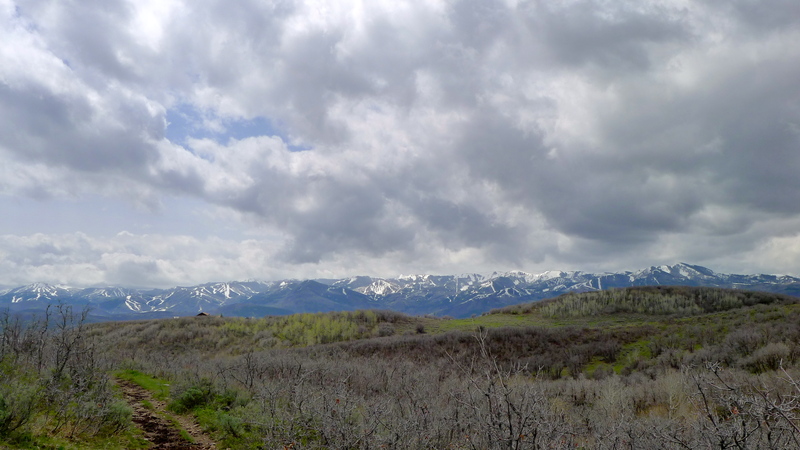 The book explains that the area was originally explored by pioneer Parley Pratt and his twelve wives in the 1840s (gotta love Utah history!). 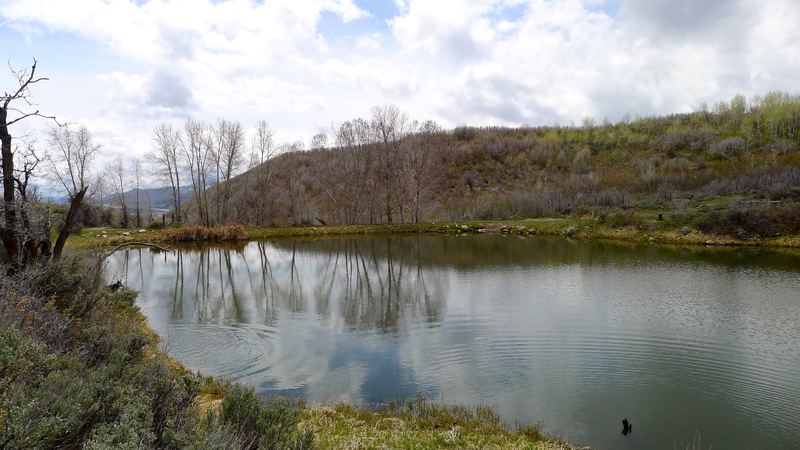 This teeny preserve is tucked into a neighborhood of rolling hills and horse properties just ten minutes from my house, five miles of trail winding through willow trees and aspens. 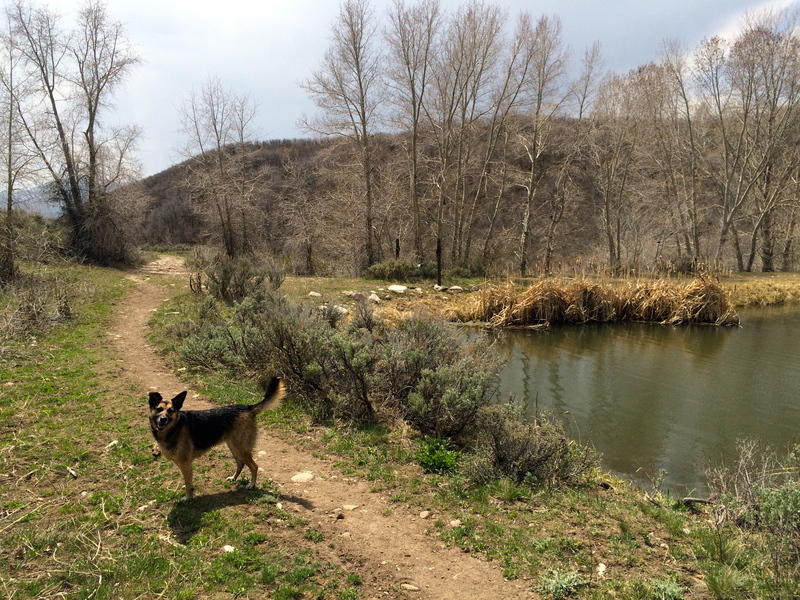 Bonus: there are a couple of beaver ponds (aka doggie swimming holes) along the way. 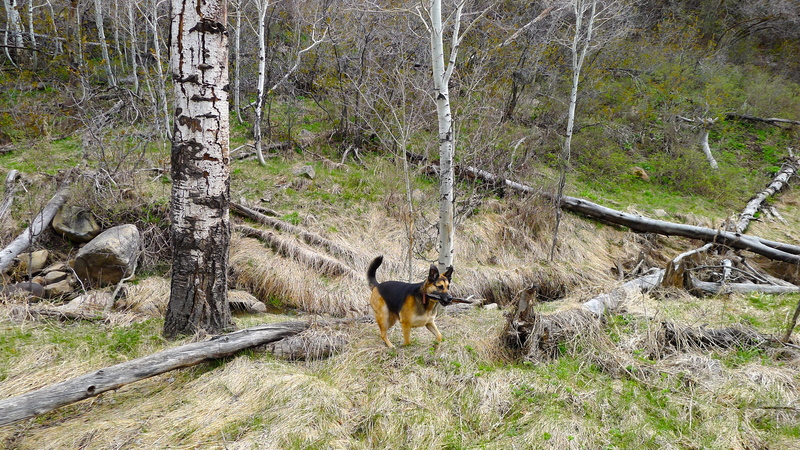 Last week, Cholula and I explored the upper part of Lewis Park. 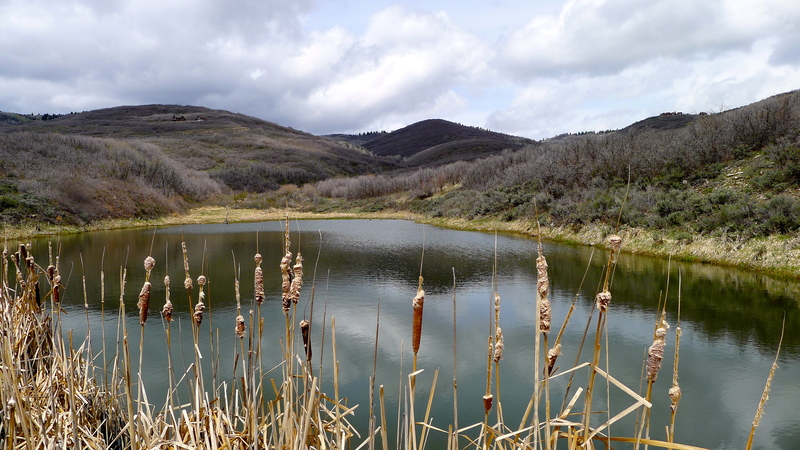 Instead of parking at the trailhead, I followed a dirt road back further; the trail there brought me directly to the last beaver pond. 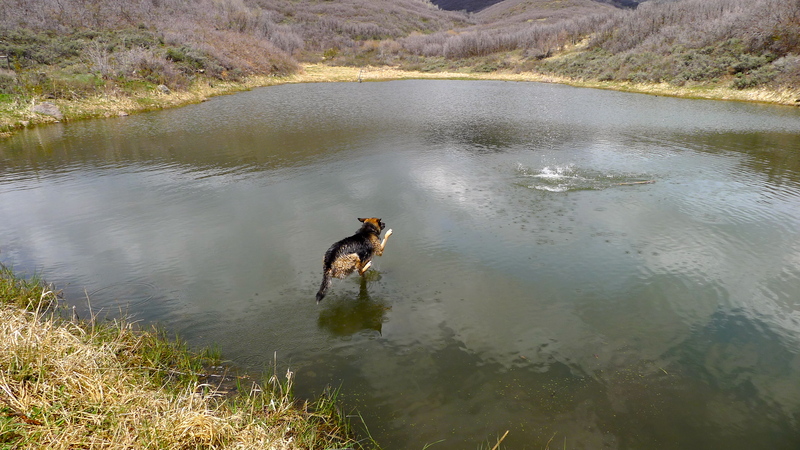 I imagine that for my dog, swimming to start a hike is like eating dessert first: bliss. I hadn’t reviewed the info in the book before starting the hike, so I really just wandered along the trails and followed Cholula’s lead. 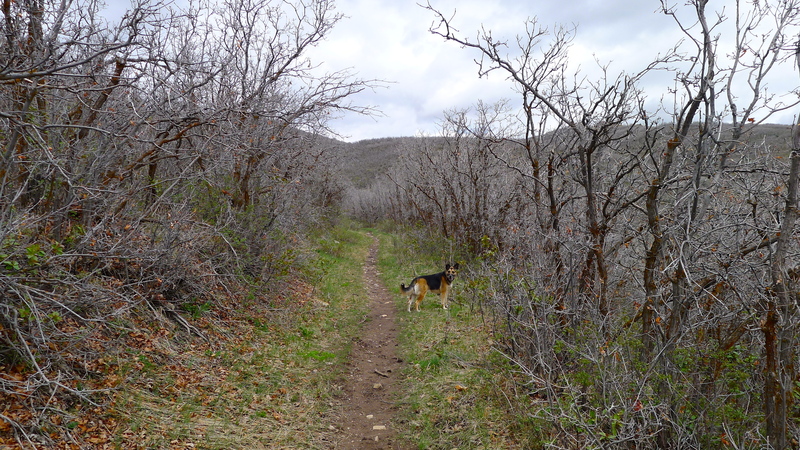 After the pond, we headed left up into the canyon (instead of right, which would lead to the main trailhead). 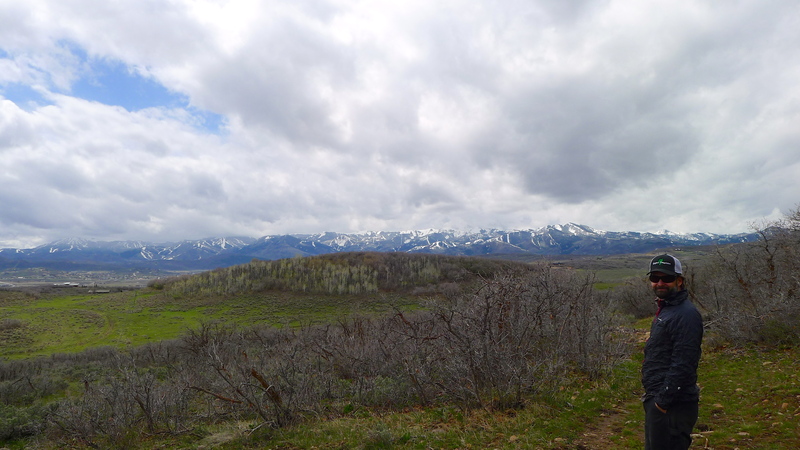 At a point where the trail split, I vaguely remembered that there was a loop section of the trail somewhere, so we headed left again. 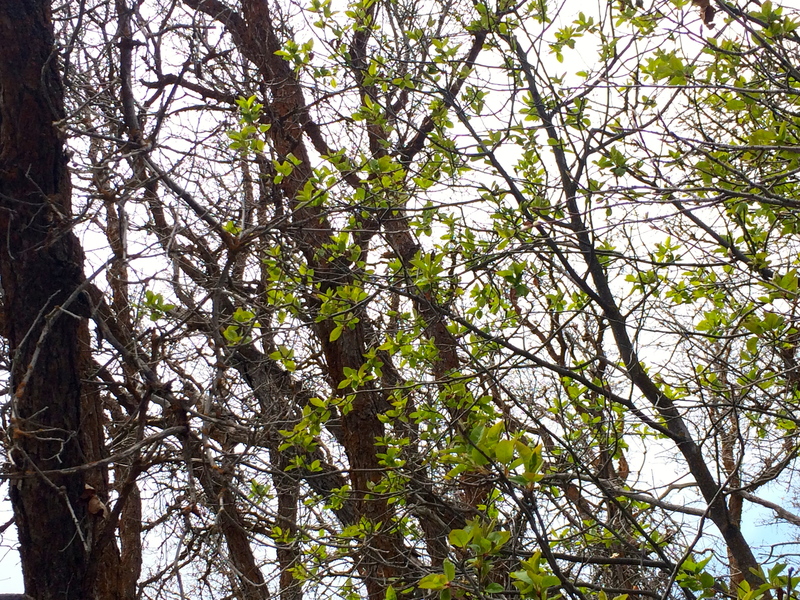 The rain threatened, but the grasses lining both sides of the trail were green and there were almost-ready buds on all of the trees. 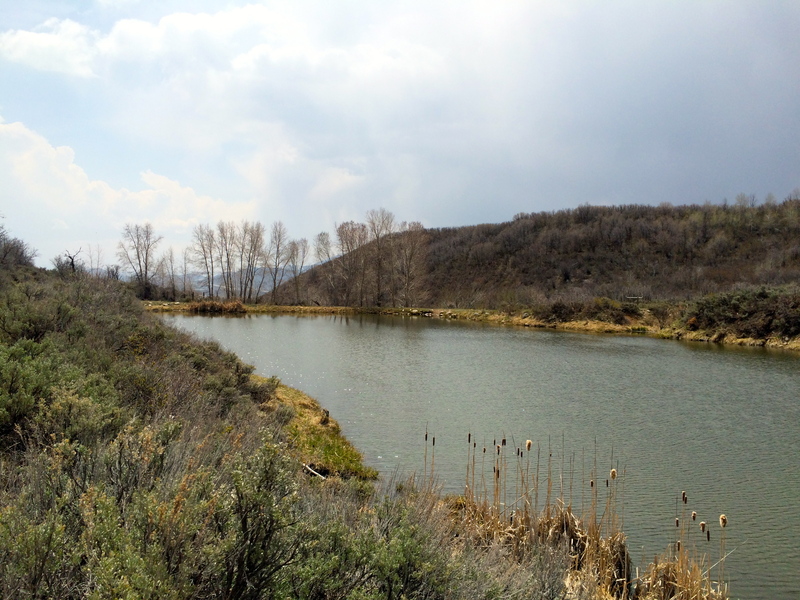 My instincts had been correct and the trail led back to the other side of the pond. Did I mention the view? Two days later, John joined me at Lewis Park. 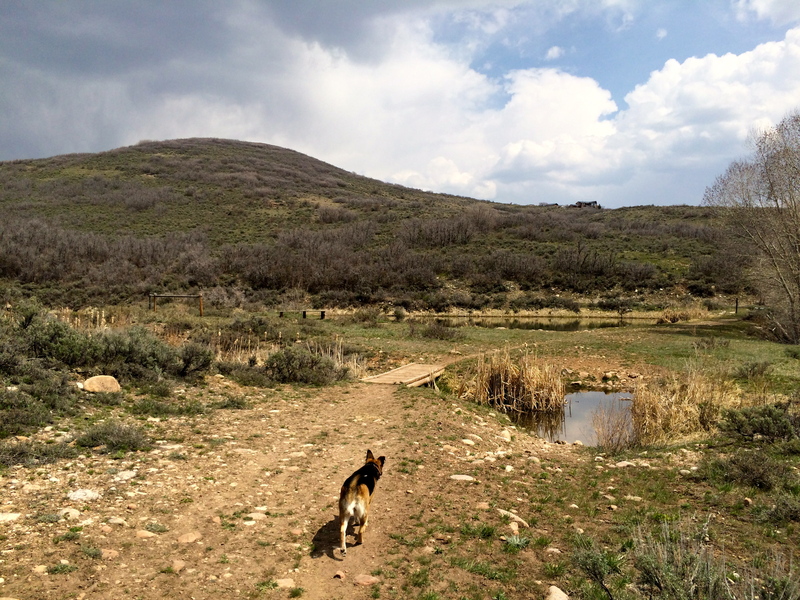 We parked at the upper lot again, but there were horses near the pond, so we reversed the loop I’d hiked. 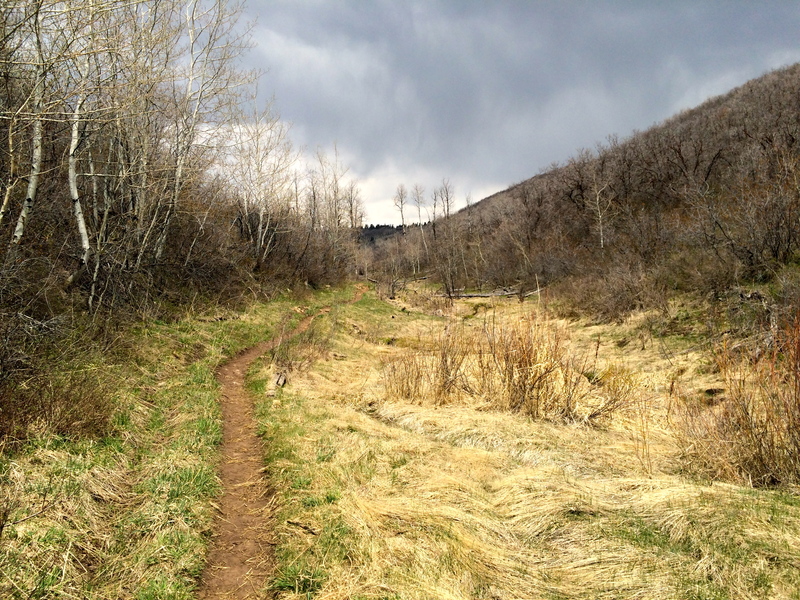 Aside from the group of riders, the trail was our own, even on a weekend. 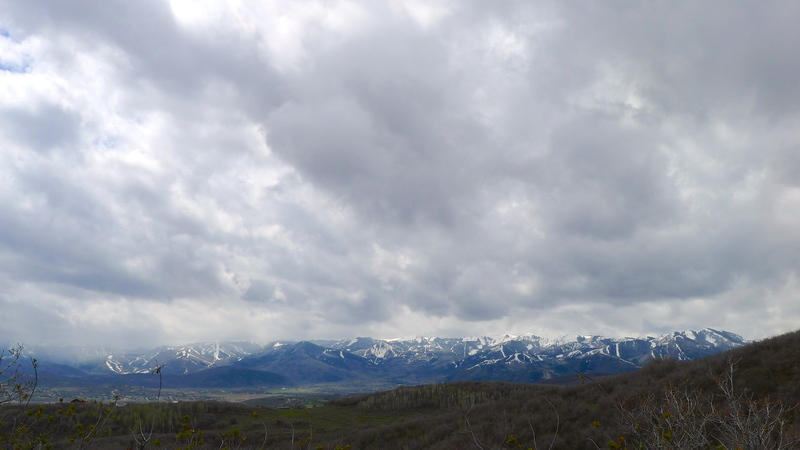 Again, the rainclouds were building, and John was fighting a cold, but our hike was just gorgeous. 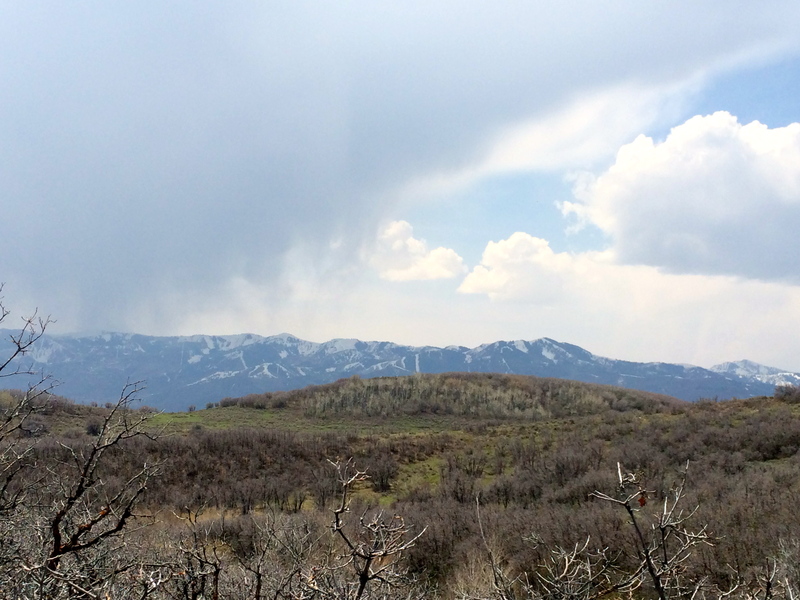 And… did I mention the view? 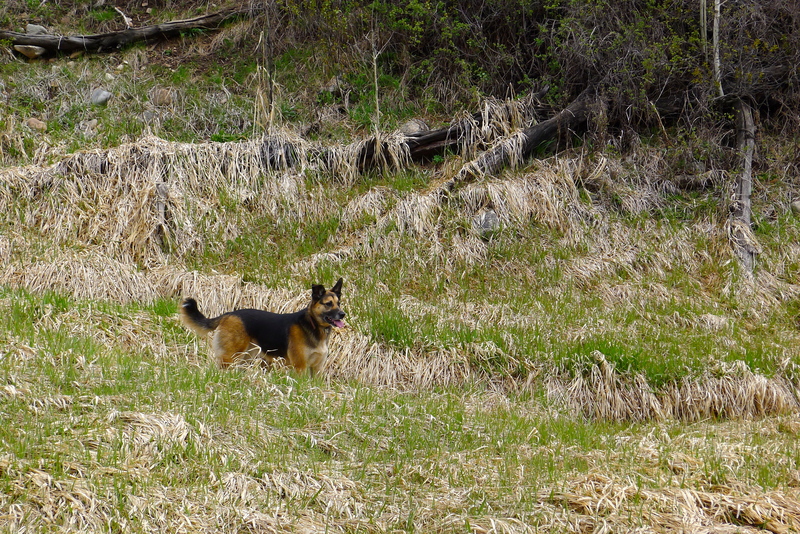 We strolled along a stream that seemed to flow right over long grasses. 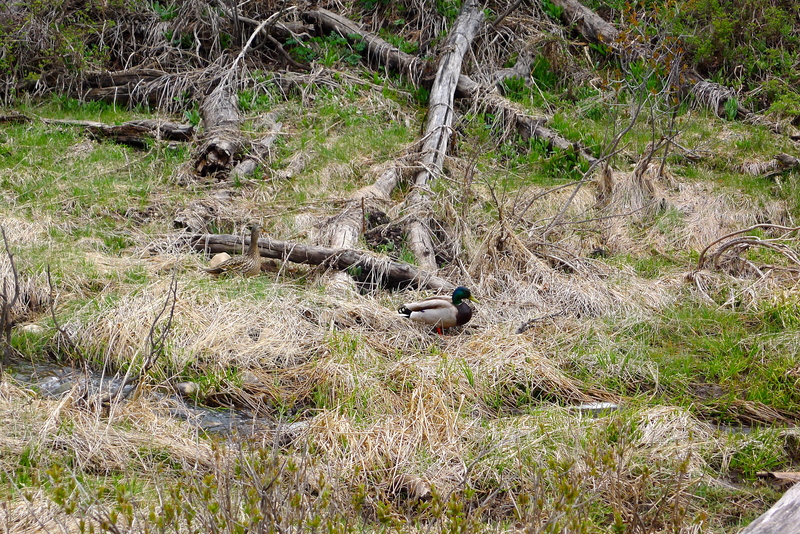 We startled a colorful mallard and his lady. 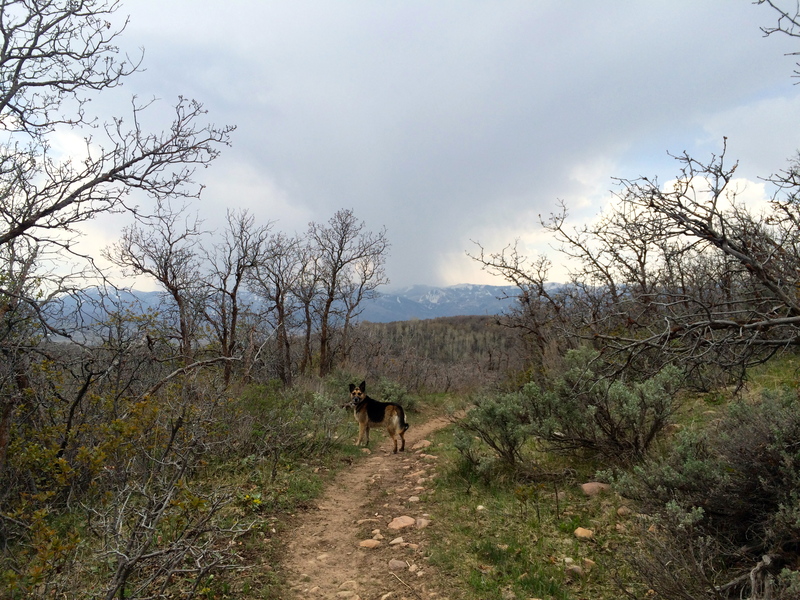 We beat the storm; in fact, the sun even came out for a bit. 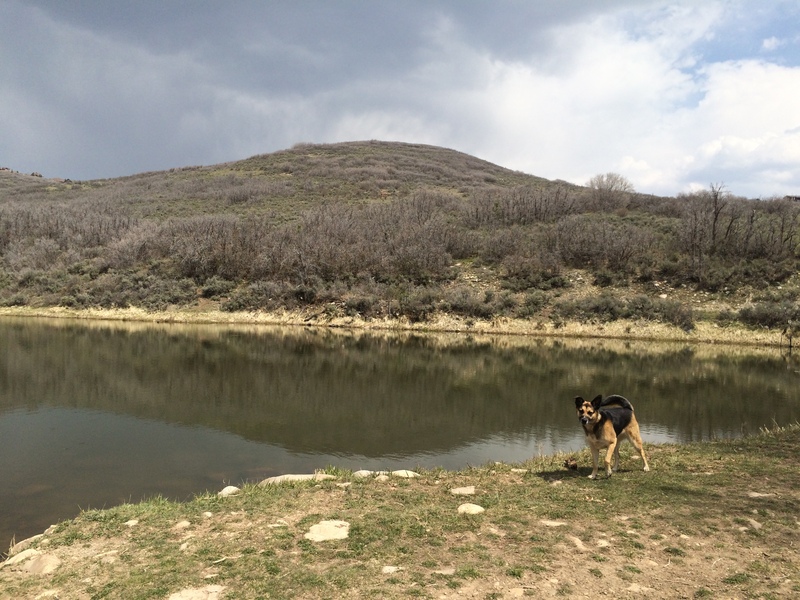 This time, Cholula’s swim was the finale: the icing on her hiking cake. 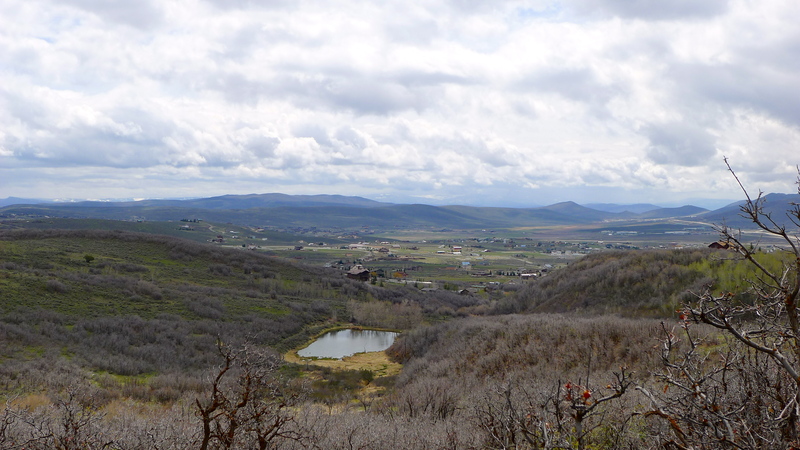 Park City is full of these secret surprises, and this one is practically in our backyard. 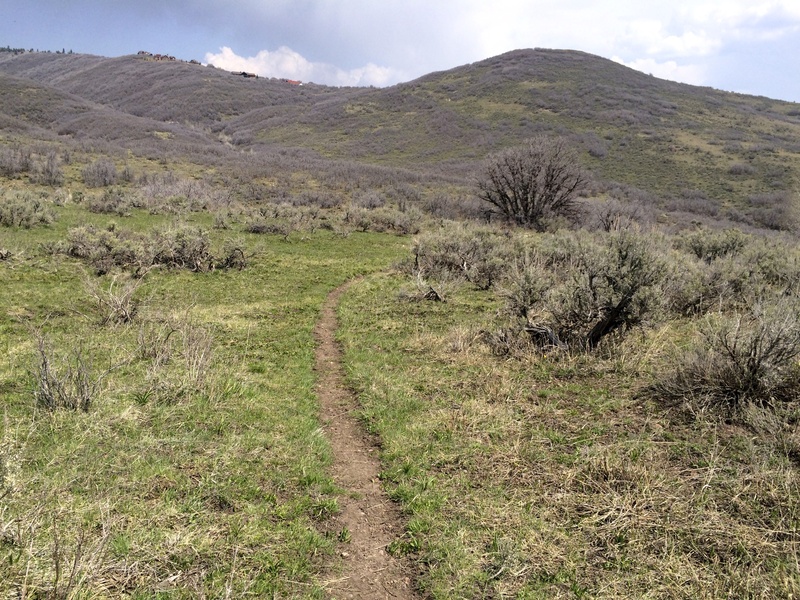 We’ll still need to explore the lower part of Lewis Park’s trail. 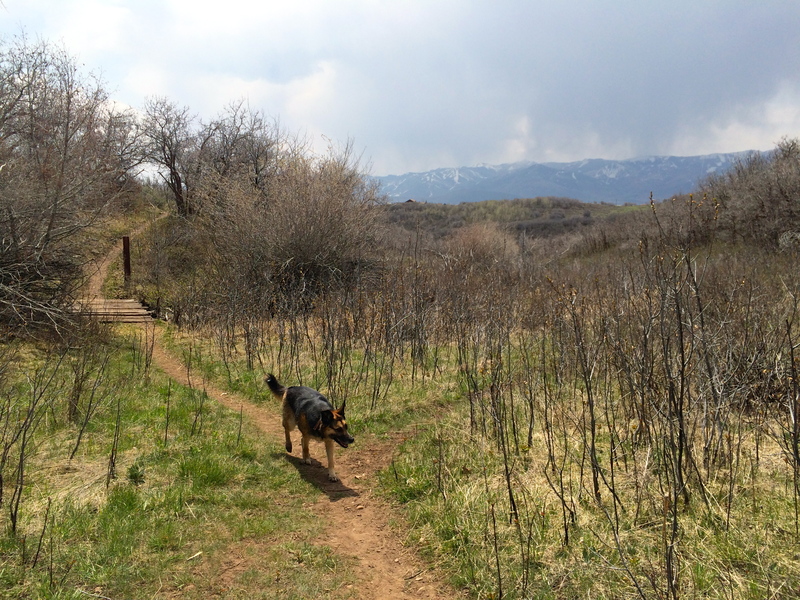 Plus, I’ve dog-eared plenty of pages in my doggie-hiking book…I can’t wait to see what other areas I can discover. What a beautiful place I call home. 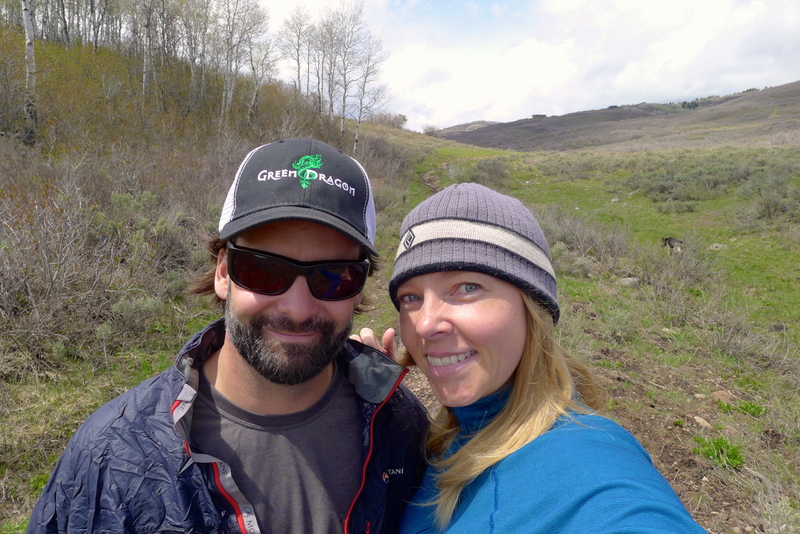 More hiking (and other adventures) in Park City. One year ago: A visit to my favorite Hawaiian island: Kauai. The mallard was probably thinking. 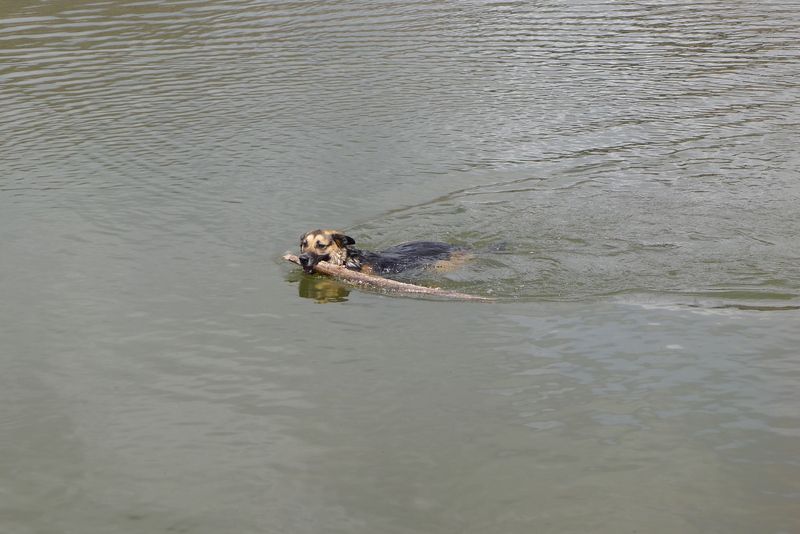 “That dog just stole my stick!” But clearly, Cholula enjoyed the heck out of it. 12 of them, no less! 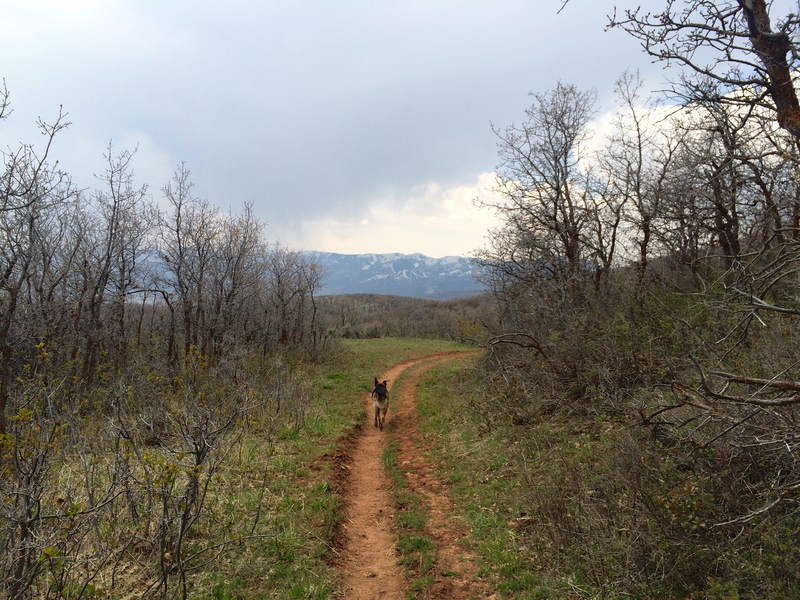 I’m a dog hiker and had a very responsive group of pups that day. I decided to venture out and check out this loop. I think I ran into you! Thank you for the warning of the bull moose! 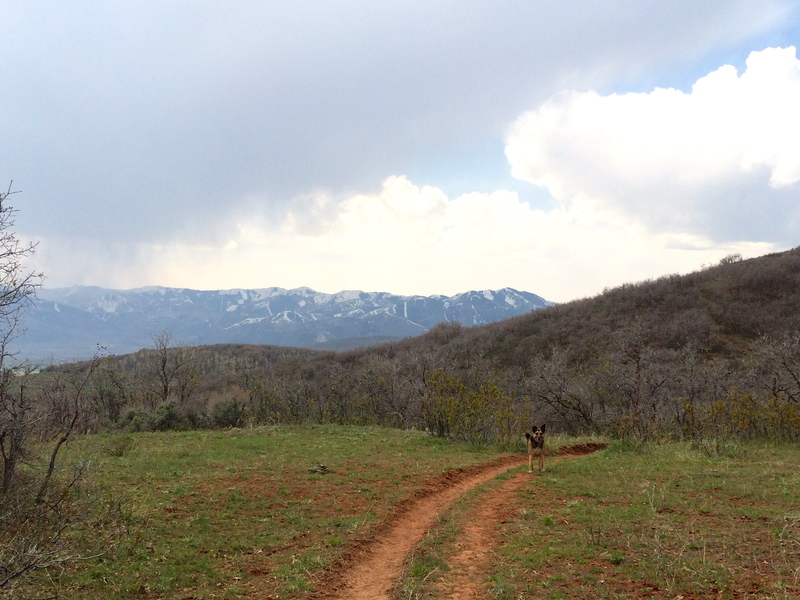 The hike was beautiful. The dogs love the water! I was having an amazing day until we ran into 2 people on horseback. My 7 month old Aussie needs to work on her barking manners with horses as she’s never seen one before, but the woman on horseback was very rude and told me the horse community there has made it a horse trail. She told me the book was published 3-4 years ago and since then they’ve changed the rules of the trail. 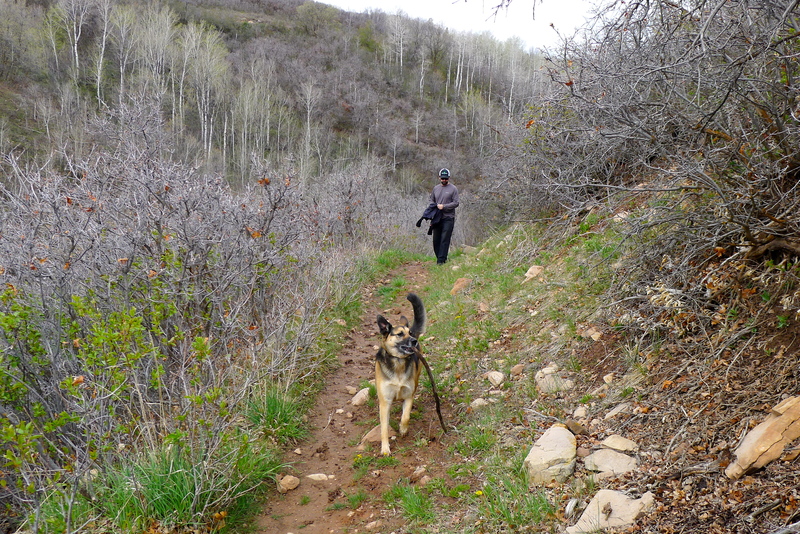 There are no signs against having dogs on the trail. Thoughts? 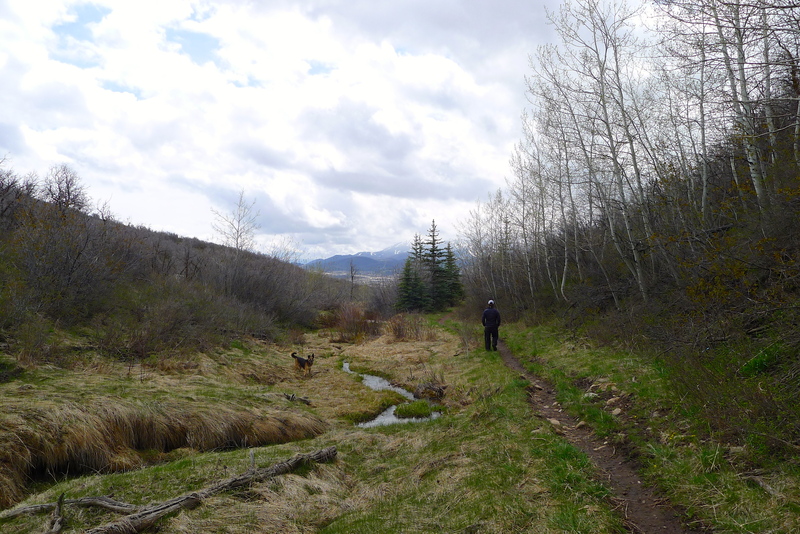 I’m so glad I was able to warn you about those moose… I suddenly realized there was a female on the right side of the trail, very close, and then turned to the left to see that big daddy! Not cool to be in between them with a dog. Yikes. Your dogs were sweet but I’m sure you had your hands full! 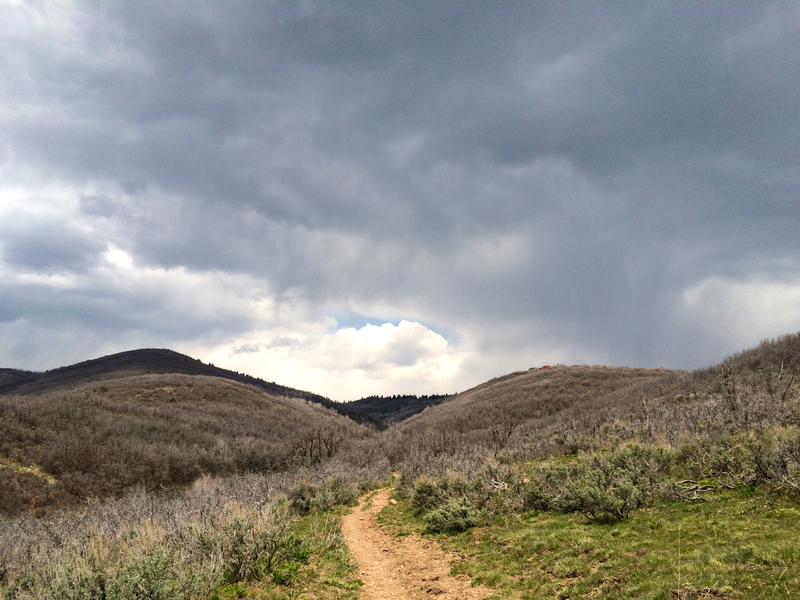 As for the horses, I haven’t been back on that trail in a couple of months. I’ve seen lots of dogs on it though and there are no signs. I know horses are welcome there but there would be signage if there was a “no dogs” rule. I have a feeling the lady just didn’t like a pack of dogs barking at her.